The massive presence of immigrants and their multicultural coexistence in the neighbourhoods of Athens are a historically recent social experience, starting in the early 1990s, when Greece changed from a sending to a host country for immigrants. The first mass influx of immigrants came mainly from the Balkans and Eastern Europe, and since 2000, there has been a significant number of refugees and immigrants mainly from countries of the Near East, Asia and Africa. Indicatively, it is estimated that since 2004 immigrants in Greece reach 10% of the total population (Baldwin-Edwards et al. 2004) and are mainly concentrated in large urban centres, mainly in the Region of Attica and the Municipality of Athens (Καβουνίδη και Χατζάκη 1999). In the dominant public discourse, immigrants were treated as a priori marginal, criminal and wretched people, while some neighbourhoods of central Athens where they reside, were branded as ‘inaccessible’, dangerous and substandard ghettos. In contrast, scientific discourse described immigrants as an internally highly inhomogeneous population group and revealed the wide range of housing options they followed, as well as the particular geography of their distribution in the city’s neighbourhoods. Specifically, the first relevant scientific studies mention areas where immigrants live socially excluded by the “locals”, homeless or crammed in squares, stations, old hotels and abandoned buildings in the city centre (Ψημμένος 1995). However, subsequent studies revealed that immigrants were able to access housing, mainly through the rental market, that they dispersed in many areas of Athens and that they extensively mixed with the “native” population, despite the existence of some areas with increased concentrations (Βαϊου et al 2007). Within a very short time, immigrants in Athens and other large cities, such as Thessaloniki, followed diverse housing strategies, many of which were hailed as “paths to prosperity” or “positive” humane courses, which upset the usual stereotypical and racist representations (Λαμπριανίδης και Λυμπεράκη 2005). In this paper, focus is placed on immigrants’ access to private housing, which is usually the last stage of a long journey as well as the “happier” and “safer” scenario for a housing solutions . To what extent do immigrants participate in the housing market, for whom is it more accessible and what is the specific geography of the immigrant homeownership? The findings presented below are based on a quantitative study, using the archives of the Athens Land Registry and focused exclusively on the Municipality of Athens during the decade 2000-2010 . Based on a random sample of 45,000 house sales, the participation of immigrants in the housing market reaches 7%, while, demographically, they accounted for 17.5% of the total population of the Municipality of Athens in 2001 (National Statistical Service of Greece 2009, 47) and for 16% in 2011 (ΕΛΣΤΑΤ – ΕΚΚΕ 2015). This is a particularly important contribution to the housing market, given their short stay in the country and the difficulties they encountered, such as low-paying jobs, lack of legal residence documents and the absence of a state welfare housing policy. The immigrants who took part in the housing market are of 57 different nationalities, which are not, of course, equally represented. 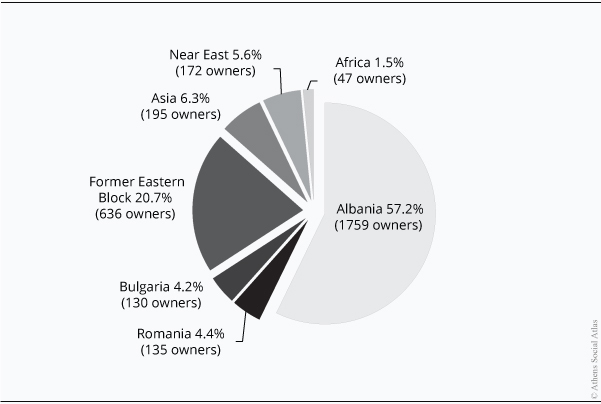 Albanians have the greatest participation in the housing market by far (as they represent the main group of foreigners), followed by Romanians, Bulgarians and individuals from the former Eastern Bloc, while individuals from Asia and the Near East participate less and those from Africa minimally (figure 1). The horizontal distribution of immigrant owners in the Municipality of Athens reveals a two-pronged geography (map). On the one hand, there are increased concentrations at the north and the west of Omonoia Square, i.e. in Vathis Sq., Attikis Sq. and Agiou Panteleimona Sq. and in neighbourhoods such as Kypseli, Viktoria, Patissia, Sepolia and Agios Nikolaos. 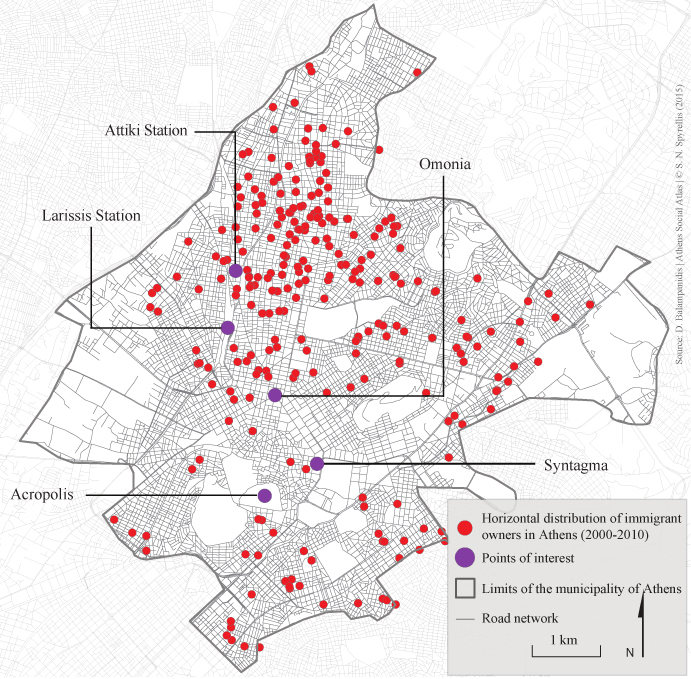 These areas are close to major transport hubs (the Larisa and Attica Stations) and the city centre and have old and cheap buildings, mostly abandoned by the “native” population, who sought better living conditions in distant suburbs since the 1990s (Arapoglou, Maloutas 2011). On the other hand, we observe a significant dispersion of immigrant owners in many other areas, almost throughout the municipality, i.e. in neighbourhoods such as Gizi, Ambelokipi, Katehaki, Ellinorosoi, Exarchia and Ilisia to the east, and Pangrati, Neos Kosmos, Koukaki and Petralona to the south. In any case, these are socially mixed neighbourhoods, where “natives” and immigrants seem to coexist without strict spatial ethnic divisions. The spatial ethnic mixing of the neighbourhoods of Athens can be confirmed also in respect to the vertical distribution of immigrant owners (figure 2). Immigrant owners are found mainly on the ground floor and up to the second floor. However, a significant proportion resides in the third and fourth floor, while very few live in basements or on higher floors. In other words, “natives” and immigrants not only live together in the same neighbourhoods but also in the same apartment buildings. There is a characteristic vertical stratification from the basement to the penthouse, but there is no exclusion of immigrants from the upper floors. The horizontal and vertical geography of the immigrants’ access to home ownership, as presented here, subverts the stereotypical idea of their spatial retrenchment in ethnic ghettos, as well as racist representations of them as a priori dangerous, criminal and wretched second-class citizens. Without ignoring the extremely difficult housing conditions affecting the vast majority of immigrants, they have started to have access to private housing, broadening the range of their “pathways to housing”. As either tenants or owners, immigrants take part in the real estate market, invest in it and settle in usually abandoned neighbourhoods and buildings. In other words, in recent years, immigrants replenished the residential population of the city of Athens, in “central” and “visible” areas, even though official policies and urban planning stubbornly ignored and kept them marginalised. “Private housing” refers to the case where someone owns a house and lives in it. Among the immigrant home-owners mentioned in this paper, we identified some who have bought a house but reside in another, rented, house or who have bought more than one houses, in one of which they live, while the rest are leased to third parties, granted to relatives, sold or remain vacant. The study in the archives of the Athens Land Registry was conducted during the academic years 2010-2011 and 2013-2014, under special permission from the Ministry of Justice, Transparency and Human Rights. It was part of the author’s doctoral thesis, with the original title: “Geography of the settlement of immigrants in urban areas. Access to housing and spatial-social segregations in Athens and Paris”, which is funded by the State Scholarship Foundation (SSF). Baldwin Edwards M (2004) Στατιστικά δεδομένα για τους μετανάστες στην Ελλάδα: Αναλυτική μελέτη για τα διαθέσιμα στοιχεία και προτάσεις για τη συμμόρφωση με τα standards της Ευρωπαϊκής Ένωσης. Αθήνα. Available from: http://www.mmo.gr/pdf/general/IMEPO_Report_Final_Greek.pdf. Βαϊου Ν (2007) Διαπλεκόμενες καθημερινότητες και χωρο-κοινωνικές μεταβολές στην πόλη. Μετανάστριες και ντόπιες στις γειτονιές της Αθήνας. Αθήνα. Available from: http://iktinos2.arch.ntua.gr/genspace/pithagoras.pdf. ΕΛΣΤΑΤ – ΕΚΚΕ (2015) Πανόραμα Απογραφικών Δεδομένων 1991-2011. Available from: https://panorama.statistics.gr/. ΕΣΥΕ (2009) Απογραφή πληθυσμού – κατοικιών 18 Μαρτίου 2001. Πειραιάς. Available from: http://dlib.statistics.gr/Book/GRESYE_02_0101_00098 .pdf. Καβουνίδη Τ και Χατζάκη Λ (1999) Αλλοδαποί που υπέβαλαν αίτηση για κάρτα προσωρινής παραμονής. Υπηκοότητα, φύλο και χωροθέτηση. Αθήνα. Λαμπριανίδης Λ και Λυμπεράκη Α (2005) Αλβανοί μετανάστες στη Θεσσαλονίκη: Διαδρομές ευημερίας και παραδρομές δημόσιας εικόνας. Θεσσαλονίκη: Παρατηρητής. Πετρονώτη Μ (1998) Το πορτραίτο μιας διαπολιτισμικής σχέσης. Κρυσταλλώσεις, ρήγματα, ανασκευές. Αθήνα: Πλέθρον, ΕΚΚΕ. Ψημμένος Ι (1995) Μετανάστευση από τα Βαλκάνια. Κοινωνικός αποκλεισμός στην Αθήνα. 1η έκδ. Αθήνα: Παπαζήσης. Arapoglou V and Maloutas T (2011) Segregation, inequality and marginality in context: The case of Athens. The Greek Review of Social Research 136(C): 135–155.